The most exciting time for any beginner is the moment they decide to start looking for a bike. If you’re thinking about riding motorcycles, chances are you already have a hot bike you’re dreaming of. Whatever you do though, don’t run out and buy that hot bike without doing a little homework first — it could save your life. If you walk into a dealership these days, some salespeople will be all too willing to sell you a bike you shouldn’t buy for your first one. When looking for my first bike I was told things like, “We’ll show you how to ride it in the alley,” or “Let’s get your credit approved and you can own this thing in 20 minutes!” while looking at models I had no business considering for a starter bike. Do your own research and don’t rely on salespeople to safely guide your decision making. So what makes a good starter bike? What I mean by friendly power is an engine that is smooth and not too powerful. Our tendency as humans is to freeze when something goes wrong, and having an overpowered bike is bad for those scenarios. I have watched inexperienced riders accelerate too quickly on a bike because they are unaccustomed to the power, only to forget they can simply let go of the throttle and end up crashing. My personal opinion is that for sportbikes, 500cc and below is a good starting point. When you twist the throttle, the engine should smoothly and gradually make power. In contrast, a Ducati superbike throttle will seem like an on/off switch to a new rider, making it almost impossible to be smooth. Smooth is the key word. Smoooooooooth. 1. Being able to put your feet flat on the ground. We’ve ALL dropped our bikes in a parking lot somewhere. Making sure you can get your feet flat on the ground is a huge deal for confidence in slow speed situations. 2. Being as close to upright as possible. Just about everything is easier if your bike’s seating position is relatively upright. It gives you leverage if you make a mistake and have to put your feet down to keep from tipping over. It’s also easier to check for traffic and look around in general when your body is more upright. 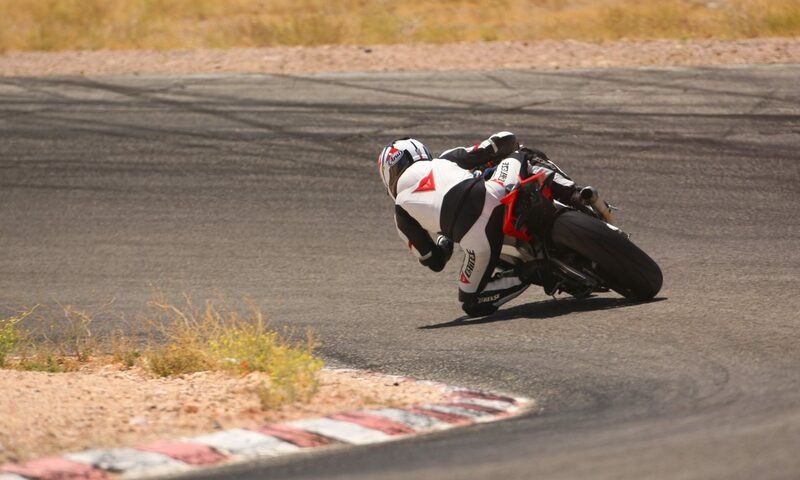 These things are more difficult when you move up to a full-fledged sportbike, because you’re leaned so far forward. If you enjoy sports or activities that rely on equipment, you’ll understand this right away. Sports like skiing, snowboarding, tennis, surfing, golf, etc. have different equipment for different skill levels. If you take snowboard or ski lessons for the first time, they don’t give you race equipment; it’s too stiff and unforgiving. Golf instructors won’t start a beginner on pro style clubs; they’re too stiff, have a very small sweet spot and rattle like hell if you mis-hit the ball. You’ll be given flexible, forgiving equipment that will let you make mistakes. Motorcycles are the same way. You want a bike with forgiving power, smooth brakes and suspension that’s soft enough so the bike helps you if you’re choppy with the throttle, brakes or steering. That’s because you’ll be choppy at the beginning; it’s just unavoidable. Another recommendation I always make is to buy a used bike for your first one. Since your first bike is a learning tool, odds are that you’ll make some mistakes (everyone does) and drop it in the parking lot or driveway. It’s better to get those mistakes out of the way on a used bike instead of scratching up a pristine brand new one. Besides, you can sell a used bike for only slightly less than you paid for it when it comes time to upgrade. I bought my first bike used for $3800 and sold it nine months later for $3500; i.e. I basically paid only $300 to use that bike for nine months. You might hear someone tell you that you’ll wish you got something bigger and that you should just get the bike you want, but I disagree. Your first bike is a learning tool and like beginner equipment in all activities, it needs to be forgiving so you can learn as quickly as possible, and then you’ll move on to the good stuff later. Most riders end up trading bikes several times anyway, and it’s surprisingly easy to sell used bikes that new riders are looking for. As for specific models, check my list of the best new starter bikes if you’re dead set on buying new. Most of them can be found as used models though, so keep that in mind as you’re looking around.